Lisa was off her feet all day on Sunday, and she got very bored and asked me if I could take her for a little drive. She worked her way to the Astro on her crutches and I helped her into the back seat. She sat there because it was easier for her to elevate the sprained ankle by setting it on the console between the front seats. Then we went for a drive to explore a part of Fernley we'd never seen. Heading south on US-95A, we crossed the Truckee Canal and turned left on a road Lisa had found on a local map. Before long, the pavement gave way to gravel, then to worse, washboard dirt. I slowed to about 10 MPH, but we were out to sight-see anyway. The road roughly paralleled the canal and led to an area known as the Fernley Highlands. I wouldn't want to live up there, not without a heavy truck to handle the bad roads. My minivan isn't built for that. As the name suggests, this is the high side of the canal. The area below is served by Farm District Road and is also sometimes called the Golf Course District. 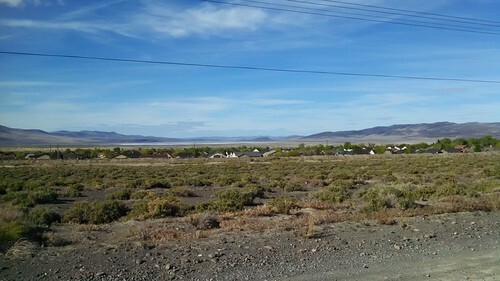 In the far distance you can see the Fernley Sink, a mostly dry lake bed. At the far end of our drive, the road crossed back over the Truckee Canal (you can see the bridge at right) and rejoined Farm District Road just before it ended at US-50A. 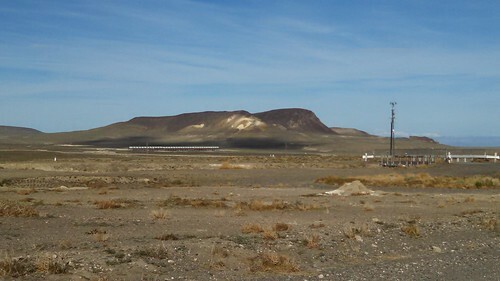 Before heading back home, I stopped and took this picture looking out to the geothermal plant east of town. This took a long time to go a short distance, and I'm not sure we'll ever go up there again, but we were glad to see more of the city in which we live. Fernley has a lot of land to hold its 20,000 residents.